Pine Bluffs is a small parcel of recreation land on the eastern shore of Lake Boon. Pine Bluffs is home to the Stow Town Beach. The western portion of the Assabet River National Wildlife Refuge is across Sudbury Road from Pine Bluffs, but this portion of ARNWR is not yet open to the public (as of 1/1/2013). A short walk down Sudbury Road can lead to the trail network in the portion of the ARNWR that is open to the public. This KMZ map is set to Draw Order 40 so it will show 'beneath' the primary map on your Garmin KMZ-compatible GPS. 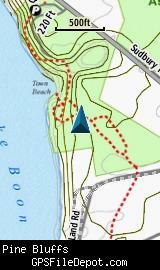 It is also designed to show 'on top' of my KMZ map of the Assabet River National Wildlife Refuge.